The initial submission of the credentials (username/password) gets an mfa_token in the response instead of auth_token and refresh_token. 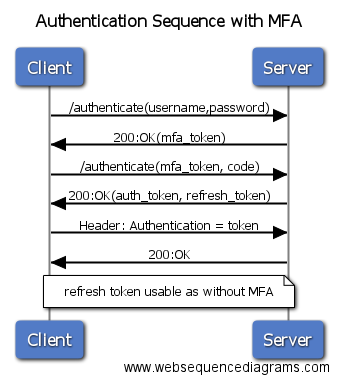 If the “fingerprint” of a trusted device is included in the first authentication request and it matches the “fingerprint” of a device trusted for this user, the auth_token and refresh_token are returned at once; if this device is already trusted, no MFA code needs to be provided in a second step. If the second authentication request is successful and includes the details of a “trusted_device” (fingerprint, operating system and browser), then these data will be stored and the “fingerprint” may be used later to authenticate in one step, as just explained in the previous note. 409 1405 Duplicated MFA already activated Cannot create new MFA key if there is already one active.